Claire spent much of her childhood sailing on the south coast of England. After gaining a bachelor’s degree in Geography at University College London she spent a couple of years in advertising. 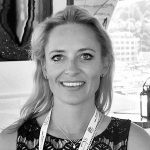 Then in 1999, her boating background led to an opportunity working as a charter broker in Monaco. She absolutely loves this profession and whilst a lot has changed since those early days, she believes the role of the charter broker is more important than ever. She has learned to ask the right questions and present information concisely and in a personalised way and believes it is very important to help charterers make their choice from a position of strength. Claire has an intricate knowledge of the charter fleet and the most popular cruising areas and particularly enjoys writing detailed itineraries. For Claire, chartering isn’t just about the yacht, but showing charterers all the amazing things they can do each day. Sincerity, attention to detail and a team spirit are the qualities she believes have helped her over the years.